I don't work on Saturday nowadays but last Saturday, I had to report to work because one of superman's patients needed dressing to be changed to prevent infection. Since there was only one patient (to which superman attended himself), I brought the kids with me so that I could bring them to botanical gardens for an instant nature retreat right after settling the patient's bill. We went straight at Food for Thought located near the Napier Road entrance for a quick brunch, then we headed to the swan lake when the little one started to throw tantrums. He stopped crying right away after seeing the terrapins and fishes swimming in the lake. He was overjoyed when I let him feed the fishes with a left over bread. Imagine his delight and fascination when fishes jump to catch every small piece of bread he throws. He kept yelling to her big sister, "Ate, look! Ate, look!" everytime a fish catches the bread. After feeding we decided to look for the swans but on our way to the other side of the lake, a huge lizard was sunbathing right in the middle of the concrete trail (see lower left photo). After taking a snapshot of the lizard, we detoured and took the other trail. 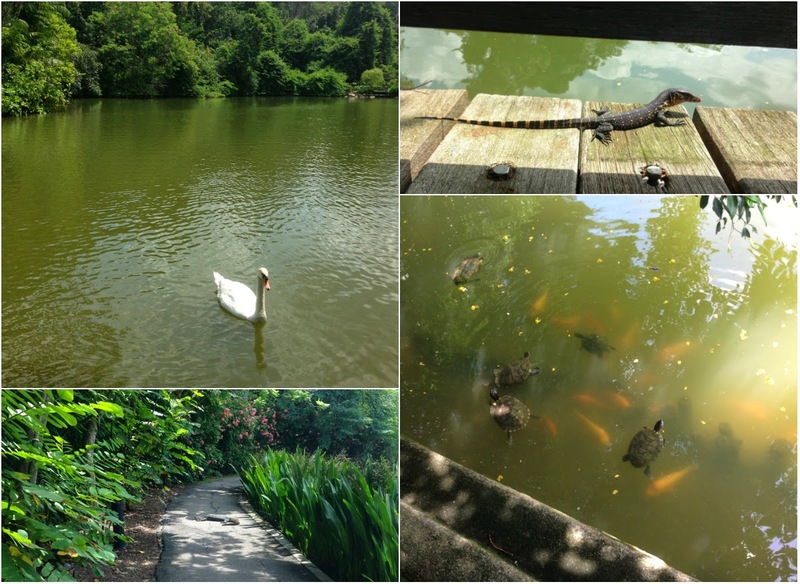 Beforehand, we already spotted two small lizards while feeding the fishes (see upper right photo). After locating the swan (upper left photo), we went on to explore the rest of the botanical gardens and we spotted yet again another medium sized lizard and the bigger kid was very fascinated while the little one was a bit scared. He mumbled, "Mommy, another way", when the medium sized lizard started crawling towards us. The brave big sister retorted, "wait baby, I need to take a photo of the lizard". By that time, my phone battery died. Lovely nature scenes. I love the swan, turtles and lizard! Happy June and have a great week!